A few weeks ago I attended the wedding of one of my very close friends. It was held at St Benedict’s Ealing Abbey which was a fantastic choice of venue; very grand which made it feel like a royal wedding. My partner and I were unfortunately late due to appalling traffic and it was most embarrassing as people turned around when we entered the church and I tried to tiptoe to a seat as quietly as possible in my gold stilettos; not an easy task I assure you! 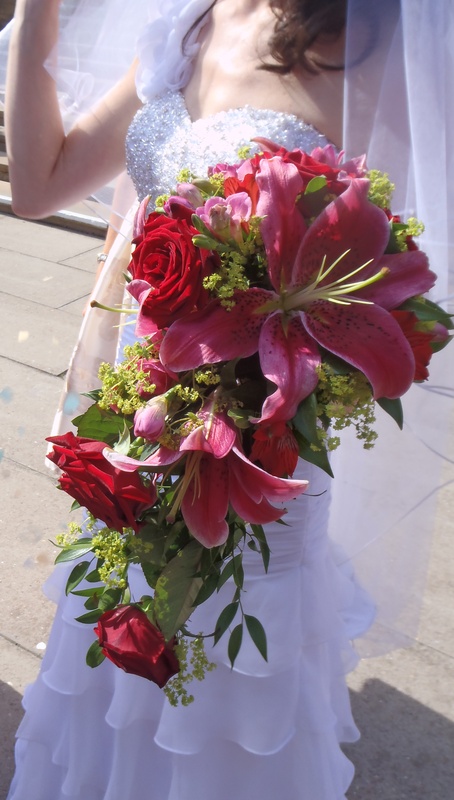 The service was lovely and the bride looked stunning in her white, one shoulder, fish tail dress with jewel encrusted bust and floor length veil. The tradition of Western brides wearing white was popularised when Queen Victoria wore a white dress in 1840. During the middle ages when weddings were less about love and more a union of two families, brides wore rich colours, the latest styles and often prized materials such as fur in order that they may display their wealth to the other family. Poorer brides would wear their Sunday best. The bridesmaids wore cream and gold Coast dresses with red satin shoes. I wore a red dress I ordered online from a site called Persun who customised it to my size. I accessorised with a toucan clutch from River Island. Following pictures on the steps of the abbey, we then travelled to the Richmond Gate Hotel. A drinks reception met us with something I hadn’t tried before – cranberry with champagne and very nice it was too. The sun was shining for a change so we could relax in the hotel garden and have some informal photos. Now already my feet were hurting but luckily my best friend was better prepared than I was and lent me some flip flops so I could rest my feet on and off! 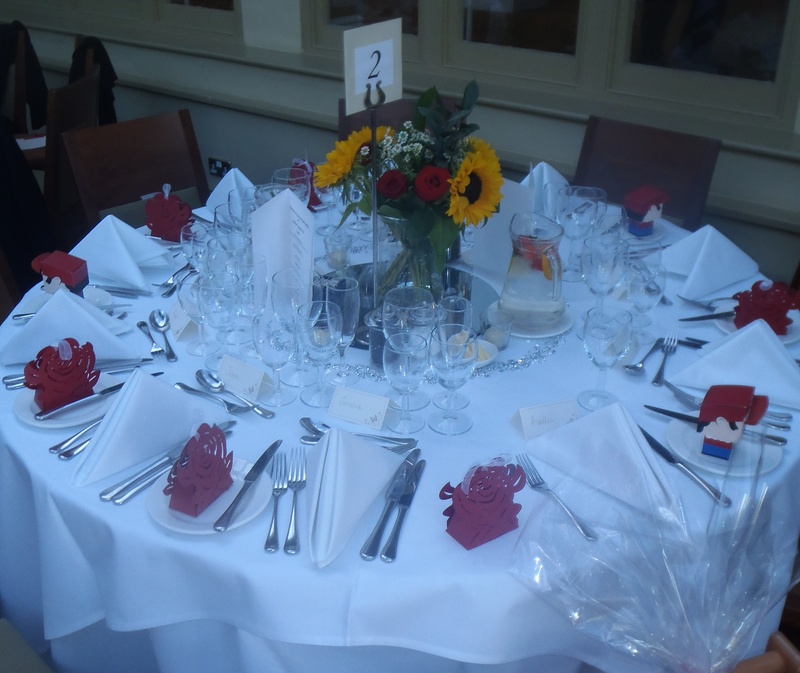 The tables were beautifully decorated with flowers and diamonds – after all diamonds are a girl’s best friend. Each table also had a box of London quiz questions which I thought was a rather innovative idea. 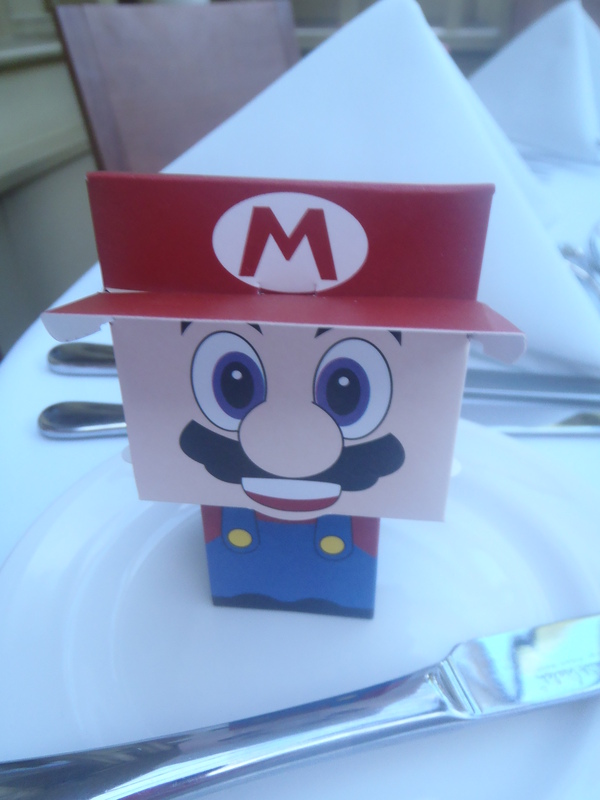 The favours were boxes shaped like roses with chocolates inside for the girls and a Mario shaped box filled with jelly beans for the boys. Wedding favours were originally called bonbonnieres and began in Europe where the rich gave them as a sign of their wealth. The boxes would have been made of gold or porcelain or precious stones and it would contain sugar as this was a rare commodity then. As sugar became more plentiful, this evolved into almonds and then sugared almonds in the thirteenth century. The common favour for weddings became 5 white sugared almonds in some pretty coloured netting or a box. The 5 almonds were to signify fertility, longevity, wealth, health and happiness. The contrast of a sweet coating and a bitter almond symbolises the bitter sweetness of marriage. Nowadays many different things are given as favours to show the bride and grooms appreciation and as a souvenir of the day. The wedding breakfast was delicious with smoked salmon to start, chicken for main and a lemon torte for afters. The best mans speech was great fun as he devised a game of bingo where he held up pictures of the groom growing up and you ticked off the ones you had. The cake was then cut and the couple had their first dance. With the formal part of the day over, the party got started with a mixture of Irish music and popular beats. It was a wonderful day of catching up with friends and partying into the night. My partner and I stayed over at the hotel as it would have been a long journey back and I certainly made paying for breakfast worthwhile, filling up on cocoa pops (I know I should have outgrown them by now, lol), a full English and cinnamon whirl! Over the last few years I have seen many of my friends get married, buy houses and become parents and I guess as we head at lightning speed to the end of our twenties this is no great surprise. As I sat down to the wedding breakfast I suddenly felt quite behind everyone, with our table consisting of one couple with a three week old son, one couple recently married in July (see previous blog ‘Cultural Celebrations’) and the other couple who married some years ago and have a gorgeous 8 month old little girl. Despite the joy of the day and the happiness I felt for the wonderful couple; a little sadness also washed over me – was I being left behind my peers? A quick Google found many attempts at lists of things to do before you hit 30 (the so called bucket lists) and there was a comedy drama made in 2005 entitled ‘Things to do before you’re 30’. There are also lists of things to give up by 30 such as not using night buses, not getting tattoos or piercing etc and of course Margaret Thatcher famously said if you are on a bus over 30, you have failed. The lists vary wildly, however there are some common themes. Most lists have learning to drive which I can tick off as I eventually passed my test on A Level results day after 5 previous failed attempts – proof perseverance pays off! There are also things such as moving out of home, getting a proper job and falling in love, all of which I can tick. I once did a vision/mood board; an idea from the cult book of a few years back ‘The Secret’ and it is interesting to look at what I have achieved off there. I did indeed start dancing lessons and I live in a Victorian terrace just like I pictured. Sadly I never did make it to become an air hostess although I did get offered the job as one – I just decided I couldn’t survive on the wages. Here I have put together my own list of things I still want to do before I hit 30, some big and some small and now I have 10 months to tick off as many as possible. Do basic motorcycle training and get a Vespa/Lambretta – unlikely I feel but hey at least I have the VW Beetle I always wanted and as my Dad once said, I’m a danger on 4 wheels, what would I be like on 2? Possibly still fancy butterfly tattoo on my hip but I am a big scaredy cat – once got all the way to the shop and backed out! Anyway to end on I wish the lovely couple every happiness for the future and thank them for being such great friends. I also want to congratulate my other friend on attending the wedding and looking fantastic, only 3 weeks after having given birth. Finally I want to share my latest purchase in keeping with the bird print trend of the summer as I’m not quite ready to let go of those warm days yet. 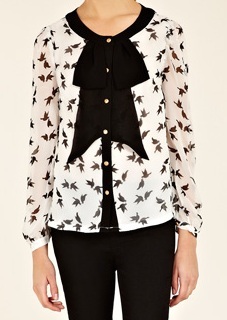 I will team this with my black skinny jeans and some black flats.